If you haven’t yet seen Guardians of the Galaxy, you might want to skip this article. Thanos and Warlocks and SPOILERS, oh my! While participating in a recent podcast with Empire Online, Guardians director James Gunn pointed out the multitude of Marvel Easter eggs that have been inserted into the film, which premiered nationwide this past Friday. Gunn also confirmed that the cocoon seen in the menagerie of The Collector (played by Benicio del Toro) in both Thor: The Dark World and Guardians of the Galaxy is indeed the cocoon of Adam Warlock! Who? Like Star-Lord prior to the character’s appearance in Guardians, the uninitiated may not be familiar with Adam Warlock, but his character and motivation are intricately intertwined with not only Star-Lord and company, but also the Mad Titan, Thanos. In the Marvel comics, Adam began life as “Him,” an artificial, genetically perfect human created by the Enclave and “hatched” from a cocoon. The Enclave was a group of scientists who wished to use this new life form for evil. Adam rebelled, and set out for the cosmos, engaging in a series of adventures, including fighting with and against Thanos on different occasions. One of these occasions was prompted by Thanos’ quest to gather Infinity Gems in an effort to become a god. Adam, along with his friends Gamora and Pip, assembles Earth’s heroes to stop the Mad Titan’s quest to rule the universe with an iron hand. Adam himself once possessed one of those Infinity Gems, which have made various appearances in the Marvel film universe – in Captain America: The First Avenger, The Avengers, and Thor: The Dark World. Several fans suspect that Marvel is building toward an all-out war between Marvel’s heroes and Thanos somewhere down the road. Thanos has already made his presence known in both a cameo in The Avengers and in Guardians. With Josh Brolin being cast as Thanos in future Marvel Studios films, the Mad Titan should play a major role in the studio’s future. 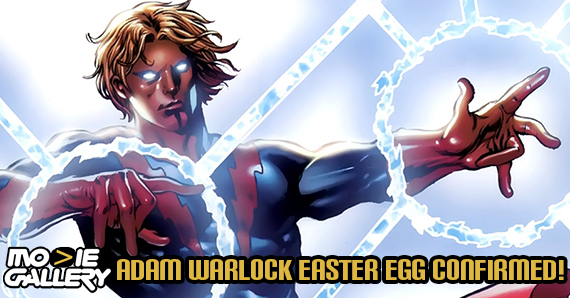 I have a lot of affection for the character of Adam Warlock. I encountered Adam in the very first crossover I remember reading as a comic book aficionado, “The Infinity Gauntlet,” in which he tried to stop Thanos from assembling the Gems. I can’t imagine a movie storyline featuring Thanos that wouldn’t eventually put him at odds with Adam Warlock. 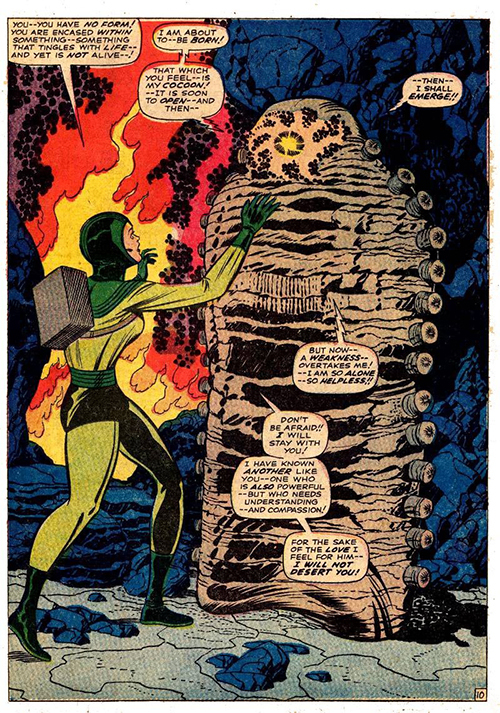 Oh, and the best part: Some folks on the Internet have noted that the cocoon looks like it has opened, which means that Adam is out there, somewhere, wandering the Marvel film universe. My 11-year-old self can’t wait. This entry was posted in The MG Blog and tagged Easter eggs, guardians of the galaxy, James Gunn, marvel, marvel studios, Thor: The Dark World by jedkeith. Bookmark the permalink.